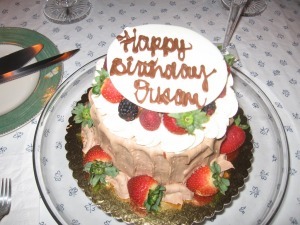 Sangria,Steamed Artichokes, Seafood Paella, and Birthday Cake! 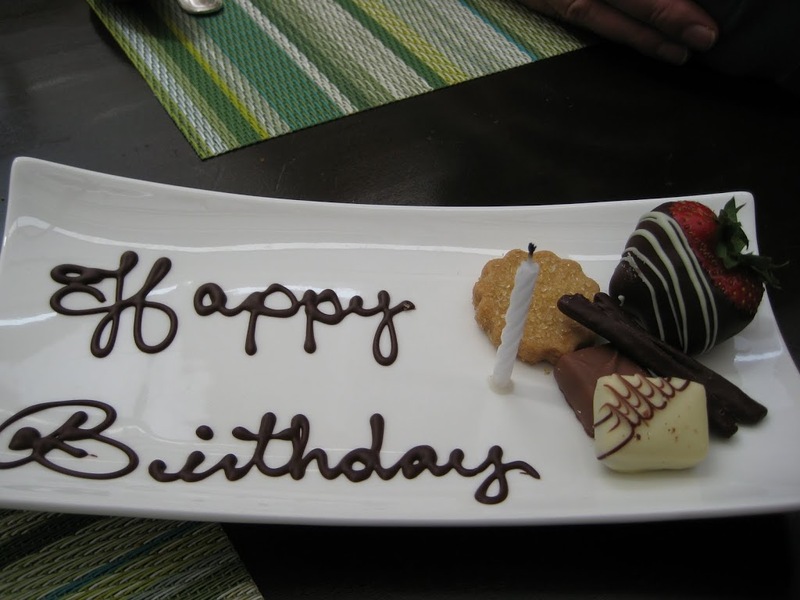 A special treat at the Biltmore in Montecito! For my birthday, John created a meal with Spanish flair! Make Simple Syrup by filling a 1-cup glass measuring cup with sugar, then filling it with water. Microwave on high in 30 second increments, stirring, then heating again until sugar is fully dissolved. 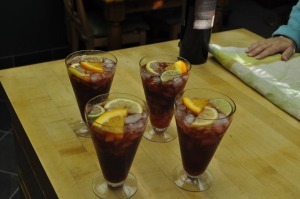 Add desired amount of Simple Syrup to wine mixture until it reaches desired sweetness. We added 1/4 cup. You should be able to taste the tartness of the citrus, and it shouldn’t be overly sweet. Pour over crushed ice and garnish with quartered orange, lemon, and lime slices. 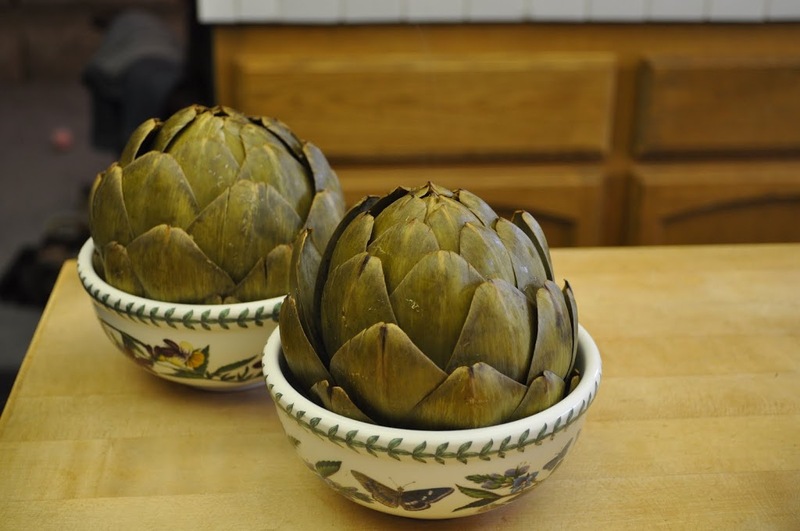 Trim stems off Artichokes and steam for about 45 minutes until you can easily pull one of the center leaves with a pair of tongs. Artichokes are great served warm, or at room temperature. 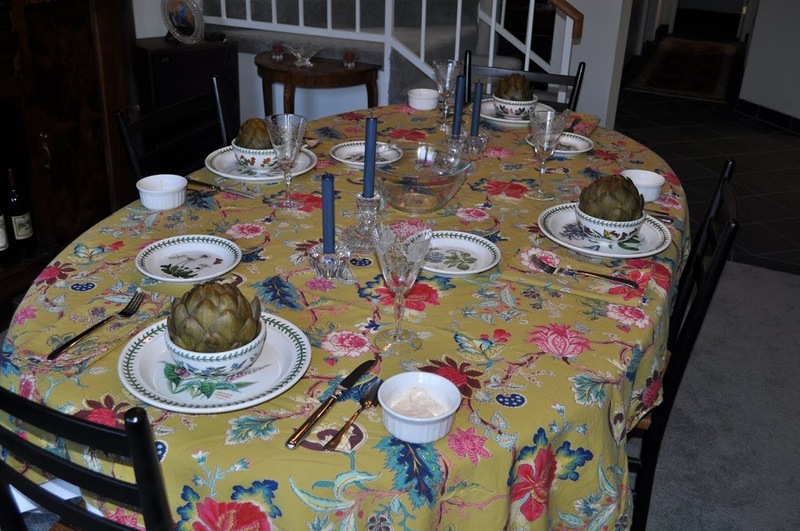 To eat an Artichoke, pull leaves off, dip base in sauce, and scrape meat off with your teeth. When you get near the center, pull off remaining leaves and clear out fuzzy part – we’ve found that a grapefruit spoon works great for this. 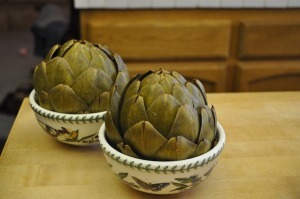 Cut the Artichoke heart into pieces and dip in remaining sauce – this is the very best part & it’s worth the work! Paella is a traditional Spanish dish. 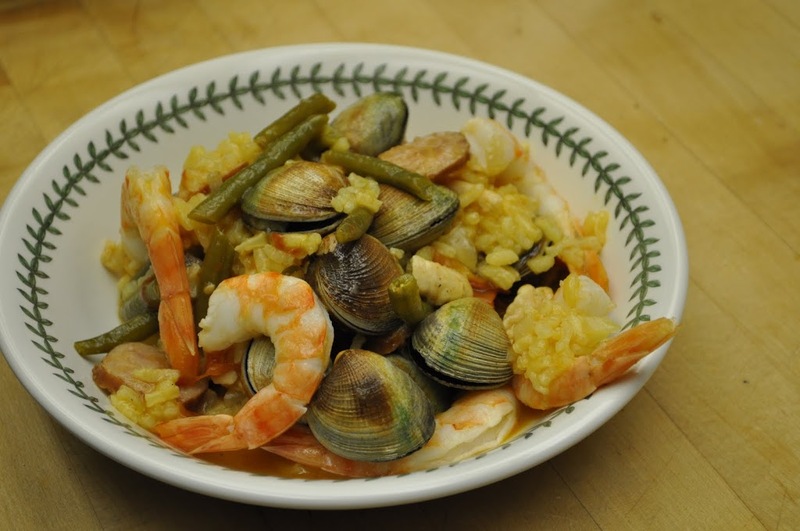 In researching recipes, we found that it varies by region, and like risotto, or pasta, forms a basis for whatever ingredients you choose to put in it. 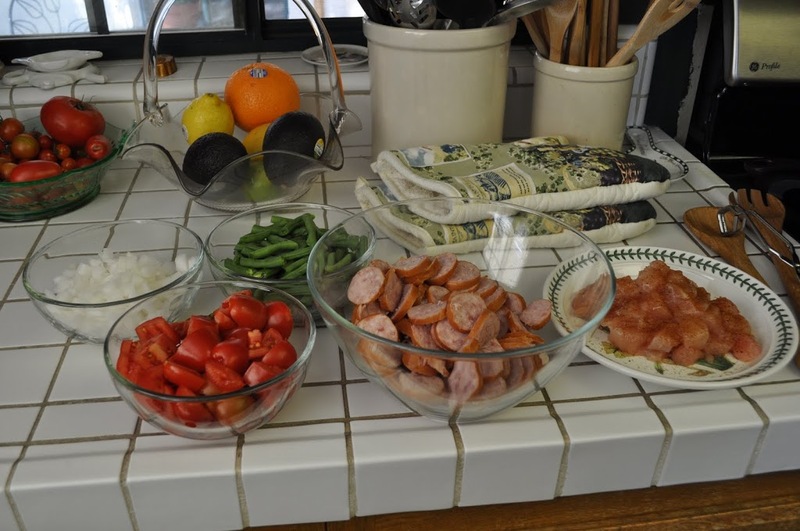 We chose a combination of Chicken, Smoked Sausage, Clams, and Shrimp. The ideal pan for making Paella is shallow with a large diameter and a lid – we used a Wok. Paella requires a bit of prep work. 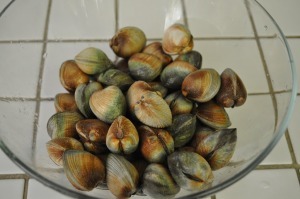 Thoroughly scrub 2 Pounds fresh Clams. 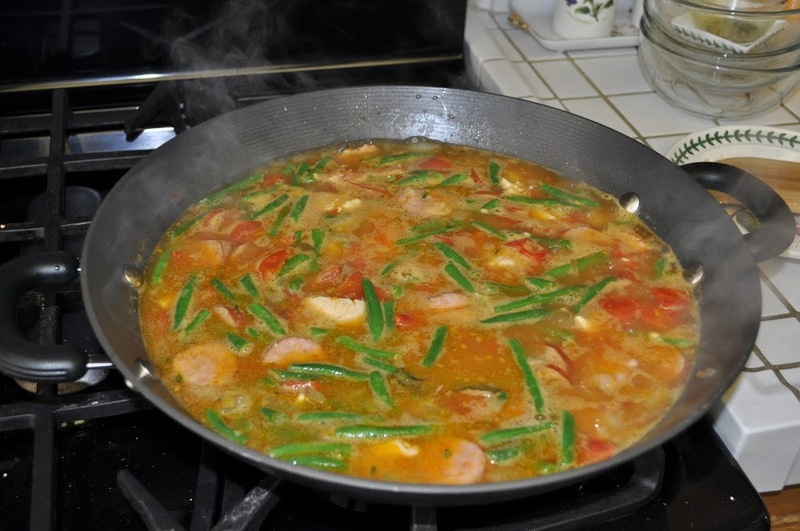 When Chicken is beginning to brown, stir in onions and cook until they begin to soften – about 5 minutes. Cover, and cook without stirring for about 10 minutes, until most of the liquid is absorbed. Stir. 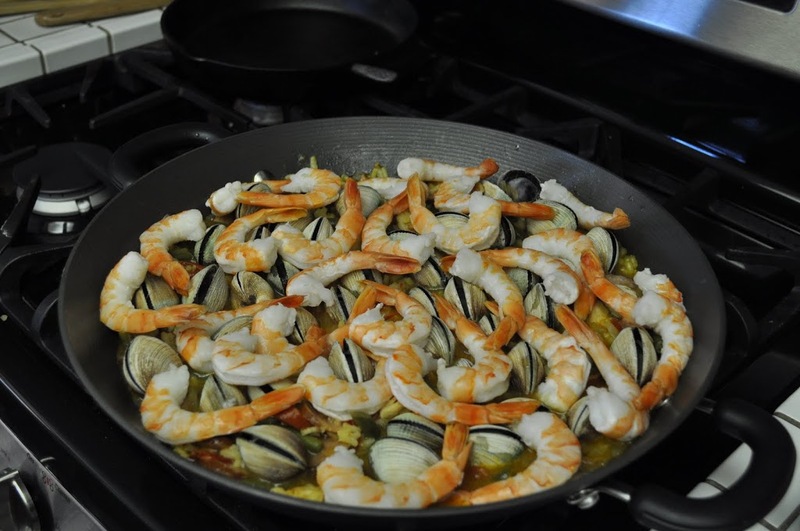 Reduce heat to low, add shrimp, and place clams on top – hinged side down. Cover and cook for another 10 minutes until clams open. Discard any clams that do not open (we had 5). Stir, and serve with fresh bread.